I swear--it catches me off guard EVERY. NIGHT. 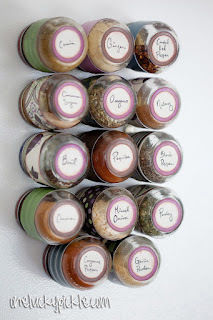 I'm stressing out trying to get it done one time, and that cursed spice cupboard is slowing me down. I thought that getting a cute 'lil spinning spice rack would help. Well, it made them easier to find, sure. But I only used something like 20% of the spices included, and lots of my recipes called for spices NOT included in the rack, so I ended up back where I started. 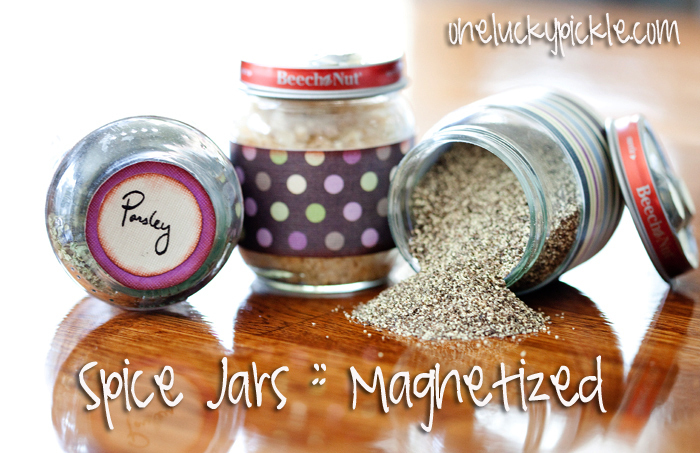 I had seen some magnetic spice jars in magazines, but I couldn't justify the price tag. So I decided to try my hand at making my own! Out of baby food jars. 2. Remove labels and wash bottles and lids in the dishwasher--don't stress too much about that little sticky spot from the label. You'll be wrapping the jar with paper anyways, so it's not a huge deal. 3. Choose your color scheme and paper. To make my job easy, I picked up the Latte Stack at JoAnn's, along with its coordinating solid pack. These go on sale all the time, and there are always coupons floating around. But anyhoo--whatever paper you choose, cut it into 1" wide strips, and make sure they are long enough to wrap around the jar and overlap a little bit. 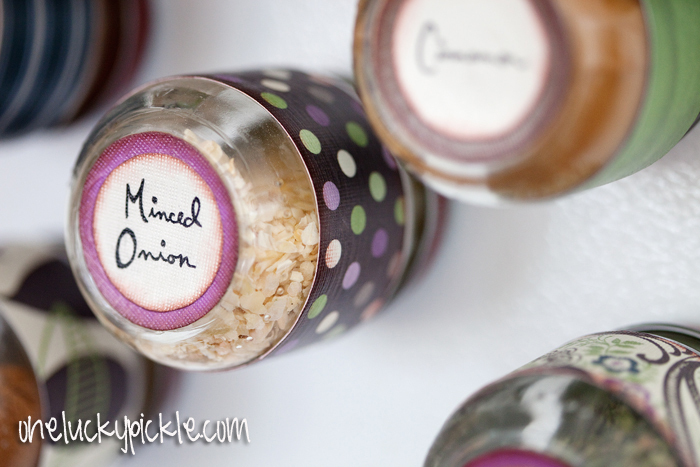 You will need to cut out circles for the labels, as well--two for each jar. I don't have a fancy paper cutter, so I went about this the old-school way. I pillaged my box with old coins, and found two that were about the right diameter. I think I used a silver dollar and a quarter? Maybe? Once I cut everything out I distressed the edges with brown distressing ink. 4. 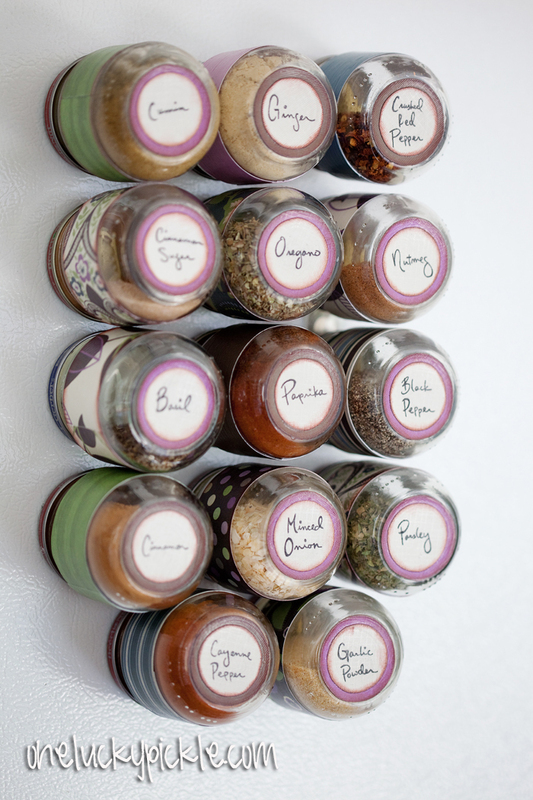 Fill in your labels with your spice names. I wrote mine by hand, but you could also use your printer before cutting them out. I just searched for "earth magnets" on ebay. These ones are 1" x 1/8". 6. 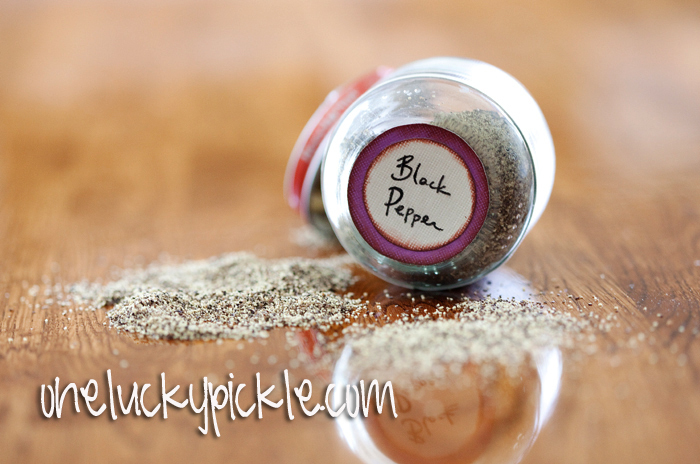 Now it's time to assemble your spice jars! Use the Mod Podge to adhere the strips around the jar, let dry, and then cover the strip with another coat to give it a nice even sheen. 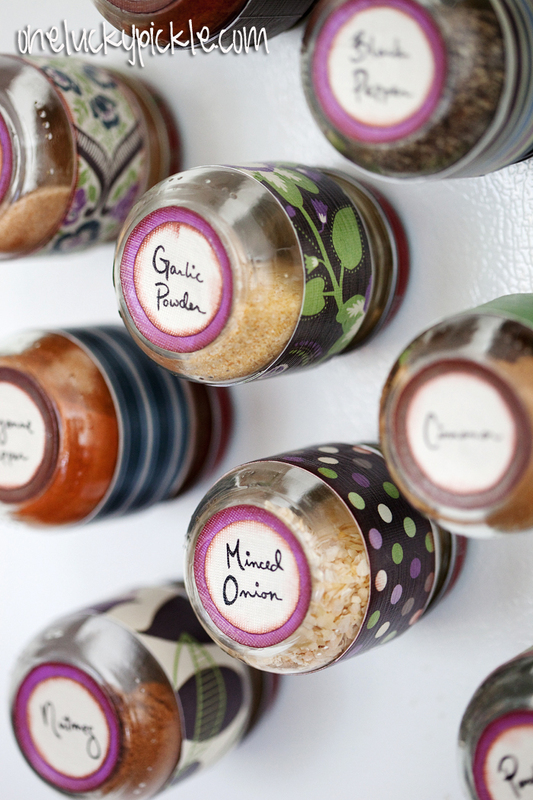 Use the same method to adhere the labels on the end. Glue the bigger circle first, then the smaller one with the spice name, then cover the whole shebang with a final coat. 7. Glue your magnet(s) to the lid using hot glue or super glue and you're good to go! I originally posted about these HERE, buuuuut I have since taken new photos for an article I was featured in on HGTV.com. You can find it HERE! I saved baby food jars for months with the intention of making these, but then we moved and I didn't want to pack and haul a box of little glass jars across the country. And now I'm kicking myself for like the zillionth time for not saving them and making this project . . . I love it, and it must clear up so much cabinet space! Rachel. Just buy the fruit kind and eat 'em up. lol. They are so yummy and soon you'll have them to do your project. Mmmm--I agree! My favorite is banana. I can't believe how good it is! You could always see if there is a community FB page and if so, you could always ask for someone (or several someones) to save them for you and after a week or so just go and pick them up. mm, I have just finished this project and put them on my fridge.. the magnets are so powerful that they keep popping off the jar lids when I go to take them off the fridge. I used hot glue and let them dry.. what kind of glue did you use? I used hot glue, and I did occasionally have issues with the magnets coming off the lid, but definitely not every time. Maybe try E6000 or a two-part epoxy? They should be stronger than hot glue, and still dry clear. (Double check before using, of course. There are probably several different options in each category!) I hope this helps! Good luck! I'd bet that if you punch a small nail hole in the center of the lid, and used JB-Weld to glue the magnet on with just a tad of the epoxy through the hole and spread out a little on the inside of the lid (You'd have to wait the whole 24 hours for it to cure)...then it would work wonderfully. Cures hard as steel, and once fully cured, no risk of contamination to the spices. Did you glue the magnets to the inside or outside of the lid? I bet they wouldn't pop off if they were on the inside? I glued them to the outside! I'll have to give it a try gluing the magnets to the inside next time any pop off! Great idea! If gluing to the inside. We must be certain no glue gets on the spices. Maybe, if the magnet is glued on the inside of the jar some type of covering could be put on top so the magnet does not touch the spices. Nay idea on what could be used to cover-up the magnet?? I have been thinking about doing some on sheet metal behind my stove as well! Those are all really good ideas, Barbara! Which grade of magnet did you use? is N35 strong enough? I found a pretty good deal on magnets, but they are N35.. Should I splurge on the N48's? I will!! Thank you for replying! I wasn't sure what to expect! haha My daughter is 2 and I am a hoarder so I have like 5 shoe boxes of all sizes of jars. I'm so excited for this project, I already have my labels made and am waiting for my Mod Podge Papers to get here!!! I am planning on making an advent Calendar for Christmas time with baby food jars and magnets and just sticking them on the fridge at kid level! I'll let you know if I get to that! lol Thank you! 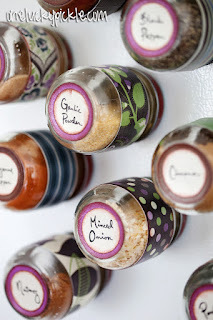 Will the magnet being on the inside of the lid cause any contamination to the spices? Or did you cover the magnet with something? I put my magnets on the outside. I'm not sure what kind of "contamination" could happen if the magnet was on the inside, but I would probably cover it with paper or something if you decide to do that. They are done!! I can't figure out how to post a picture from my iPhone. But I love how they turned out! Absolutely! As long as there's a link back to this post, we would love that! :) Glad you like them! Can you please tell me the name of the font you use on the jar? I know it is your handwriting but does that style have a proper name. If not can you email me the Alphabet of that style of writing. Also I found your website through the Good Housekeeping Website if it interests you! Great idea! I bought magnetic metal jars from Bed Bath and beyond, but they rusted in the dishwasher before first use so I returned them. They also have 4 oz and 6 oz jars. I'm considering using larger ones for baking soda, baking powder, corn starch, etc. I think I may need to buy several magnets to experiment with how much force it takes to hold them securely to the fridge without making it tough to pull them off. I would love to hear any insights anyone else has had regarding magnet strength. I plan to glue the magnets to the outside of the lid, possibly with some kind of template that ensures a perfect central placement of the magnet. I am thinking superglue, or some kind of gorilla glue or epoxy. Anyone found a bulletproof glue that has really done the job?